Our February Rider Challenge is back for its third year. Prizes will be awarded for most trips taken throughout the month so if you've been looking for more reasons to hop on a bike, now is the time. Forgot a non-essential ingredient for dinner? Get out there and bike for it! Think you might run out of dental floss next month? Jump on a bike and pick some up today! This February, it’s all about taking as many necessary - and unnecessary - trips as possible with Mobi by Shaw Go. You might find yourself in the running for some awesome prizes, and whether you win or not, discover that every bike ride is always worth it. The top 5 riders who take the highest number of trips* in the month of February will win one of the below prizes. A trip is defined as a ride 2+ minutes long. You can take as many trips in a day as you like. We will keep track of the number of trips you take and announce the highest trip counts weekly on social media. To keep track of your trips, visit our Mobi by Shaw Go app or log into our website. The winners will be announced on March 1, 2019. Contest begins at 00:00 PST on Thursday, February 1, 2019 and ends at 23:59 PST on Wednesday, February 28, 2019. We had some committed Mobi-ers participate in the challenge last year. Last February, our top rider took 278 trips. That’s an average of 9 trips per day! Share a picture of your Mobi by Shaw Go ride and you will get 1 trip added to your final count for each picture shared. 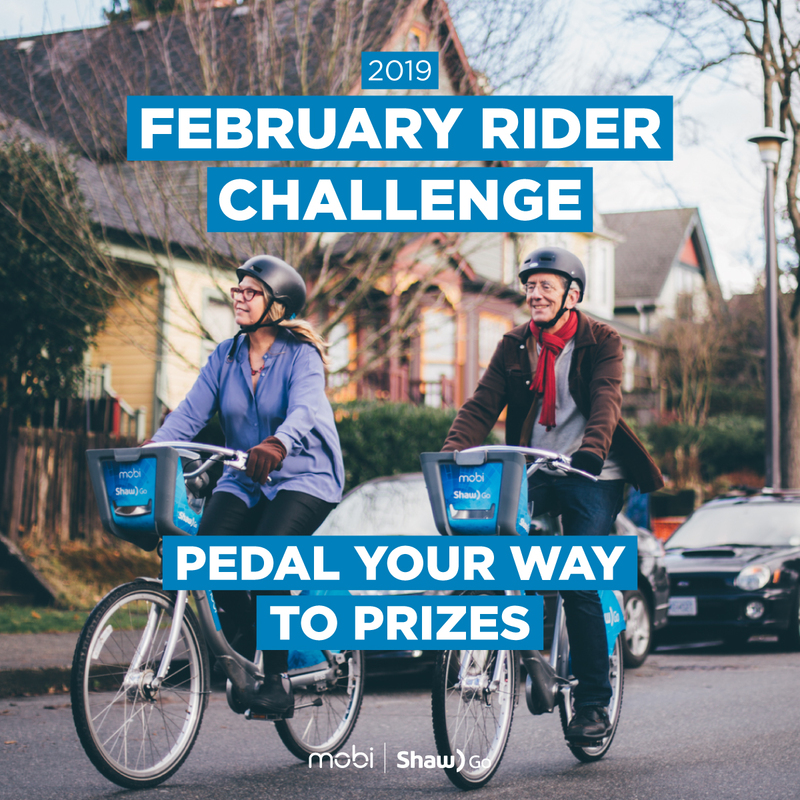 Make sure to tag us @mobi_bikes and use hashtag #Riderchallenge for your picture to count. Feel free to post as many pictures as you like, every unique photo counts. Get rolling, every day counts!